We tend to think of failing eyesight as a consequence of getting older – something we should expect rather than something we can prevent. Of course, that is partly true. As we age our bodies defences weaken and our visual abilities are reduced, but that does not mean we cannot slow down the decline. In fact, there are a number of scientifically proven ways to help maintain a good level of vision. By making a few sensible lifestyle choices, you will have a much improved chance of better eyesight in your old age! 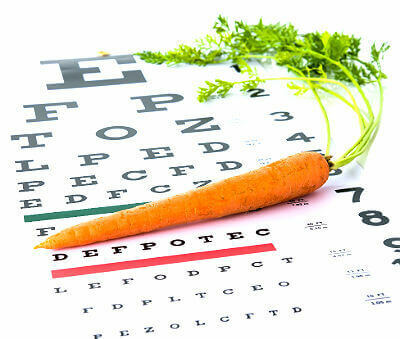 A diet that protects against eye diseases is much the same as one that benefits your overall health. Think vegetables and fruit rather than sugar or fried foods. The Mediterranean diet is a good one to follow as it is healthy and tasty! It has also been shown to balance blood sugar levels and reduce the chance of blindness in people with type 2 diabetes! This may be because of the green leafy vegetables and fish that are consumed. Omega 3 fatty acids are commonly found in fish and help lower the risk of AMD (age-related macular degeneration) by 22%. In addition, green vegetables contain the antioxidants lutein and zeaxanthin. These protect against AMD and cataracts! Another essential snack to include in your eye health meal-plan are nuts, which are proven to slow down eyesight decline. If you are serious about keeping your eyes working well, you have got to stay active. There is now an abundance of information to demonstrate that exercise is a superb method to achieve this. For those people who suffer from glaucoma, walking or jogging have been shown to reduce the intra-ocular pressure that is caused by the condition. Other studies have also backed up these findings. Currently, glaucoma is treated by eye drops or surgery to relieve the pressure, so any natural way to achieve this is extremely beneficial! Overweight people or diabetics should exercise to stabilise their blood sugar levels. This improves insulin sensitivity, and helps avoid the complications of developing diabetic retinopathy. One of the worst possible habits for eye health is smoking. Over time, cigarette smoke harms the eye lens and some of this damage is irreversible. However, the available evidence is not all bad. Researchers in Australia have found that the risk of cataracts decreases if a person quits smoking, so the sooner you stop, the less permanent damage is done to your eyes. Being obese for a long period of time causes a number of issues for otherwise healthy eyes. The stress of extra weight means that all your body’s organs have to work harder to maintain a normal level of function, and the eyes are no different. Having a higher Body Mass Index has been repeatedly linked to an increased likelihood of developing cataracts, while obesity is also proven to elevate eye pressure in glaucoma. Put simply, staying in shape will keep your eyes healthier for longer, while poor weight maintenance will have the opposite effect. By sticking to these 4 golden rules, you are helping your immune system protect your eyesight, and potentially reducing the need for future medical care.